Home > Post Office Savings > Interest rate cuts on Postal small savings, what’s your recourse? Interest rate cuts on Postal small savings, what’s your recourse? 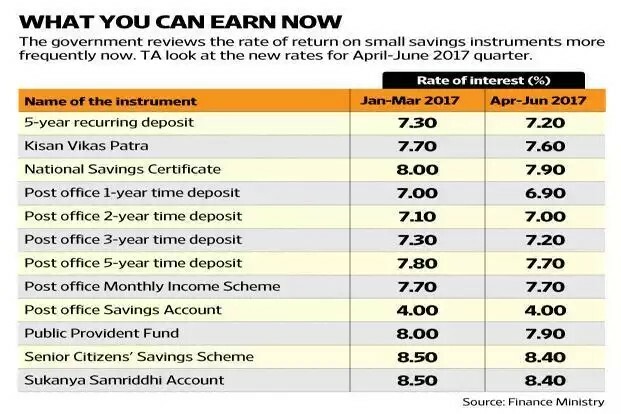 No one would have expected PPF rates to touch a 40-Year low after it dipped below 8% to 7.9% following a government notification which lowered interest rates on small savings by 10 basis points or 0.1% starting April 1, 2017 to June 30, 2017 . Interest rates on these instruments are reset every quarter based on the prevailing yields on equivalent government bonds. Out of the four quarterly resets in the last one year, three saw a drop in interest rates while one maintained status quo. This secular decline in interest rates has largely been due to the impact of falling inflation rates in the economy. As interest rates fall, they need to save more to meet their life time goals. It is a double whammy in cases where the cost of the goal is also rising like say for higher education and also where one depends on interest income for day to day expenses.